In the black water of a Louisiana bayou, the water ripples where a slender form glides just beneath the surface. It appears to be a snake, but look closer at the long, narrow spike of a beak. It’s a Snakebird, a colloquial name for the Anhinga, swimming with just its head and neck above the water. An Anhinga hangs motionless in the water or swims slowly just below the surface, its neck crooked, like that of a cobra. When an unwary fish swims close, the bird’s head darts forward, impaling its prey. Then it flings it in the air and downs it headfirst! Spanish moss hangs eerily from cypress trees rising from the black water of a Louisiana bayou. The water ripples where a slender form glides just beneath the surface. At first glance, it appears to be a snake. But look closer, and you just might see a long, narrow spike of a beak at the tip of a slender neck. It’s a Snakebird, a colloquial name for the Anhinga, swimming with just its head and neck above the water. When hunting fish, an Anhinga hangs motionless in the water or swims slowly just below the surface, its neck crooked, almost like a cobra’s. 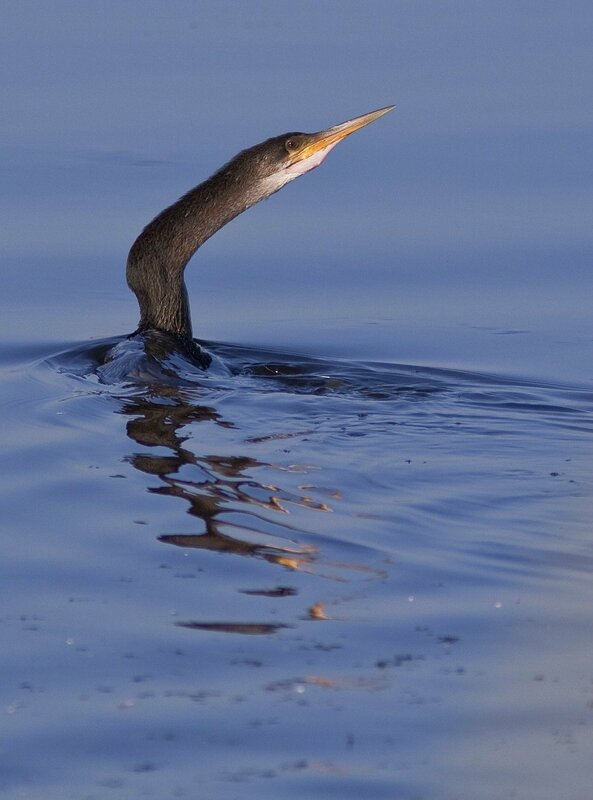 The Anhinga has specialized muscles and a hinge in its neck. And when an unwary fish swims close, the bird’s head darts forward, impaling its prey. Backward slanted serrations keep the fish from slipping off. Surfacing with its beak held just slightly open, the bird flicks the fish upward and catches it in mid-air. Then it downs it headfirst. And, once again, the Anhinga glides through the black water. As always, you’ll find photos and videos on our website, BirdNote.org. Bird sounds provided by The Macaulay Library of Natural Sounds at the Cornell Lab of Ornithology, Ithaca, New York. 136256 recorded by Martha J. Fischer. Anhinga the "Snakebird" Famous spear technique for a fresh meal "water turkey"